Storm is a colocation provider with a secure, dedicated data center located at our main office in Ottawa, Ontario, and we provide the power, bandwidth, IP address and cooling systems that our customers require to successfully deploy their server(s). Alternatively, we also provide a managed Virtual Private Server (VPS) Hosting, if you do not have your own. The price for colocating your servers at our facility start at $100 per rack unit, per month. The price for leasing our VPS starts at $20 per month for our basic service. The Storm Managed Server Administration Package includes virus protection, software updates, server security, and backup protection. Storm will provide daily back-up services that include O/S, applications, information data and databases. The client will supply Storm all necessary software plus the original software keys. The client will supply Storm with two (2) complete sets of back-up tapes, so that storm will maintain one (1) set on-site for daily back-ups, and the other set to be sent to an “off-site” storage area. These tapes can be rotated weekly by Storm technicians, as requested by the client. Storm installs and maintains up-to-date anti-virus protection, helping to ensure the client server is protected from attacks and viruses. The cost of the anti-virus software is the sole responsibility of the client, and must be provided to Storm with the original keys. Storm will install ongoing patches provided by the software manufactures by configuring the server to auto search and load as patches are released. Storm will notify the client of problems on a priority basis. This is accomplished through assigning dedicated members of the Storm team to the Storm Server Monitoring System as well as the WebGuard Paging System. Storm knows you have enough on your plate without worrying about your server’s security or bandwidth costs, that’s why we’ve opened our Data Center to you. We can house your equipment, anywhere from a single tower or 1U server to a full 42U rack cabinet at very competitive rates. 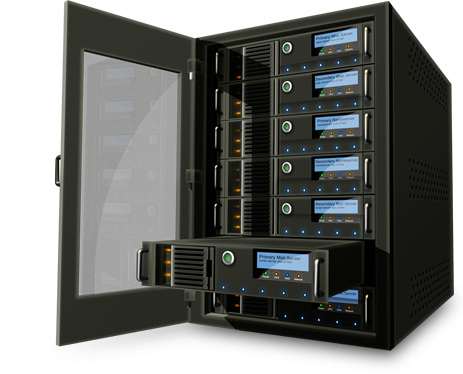 We can house your equipment, anywhere from a single tower or 1U server to a full 42U rack cabinet at very competitive rates.